Have you ever seen a Chainsaw Chick? - How about a whole team of them? "It's always a good idea to take your camera with you because you just never know when you will see chix making art with chainsaws (how often do you get to say chainsaw, chick, and art in the same sentence). " An international team of female performance carvers has been created to focus on the ever growing population of female chainsaw sculptors. 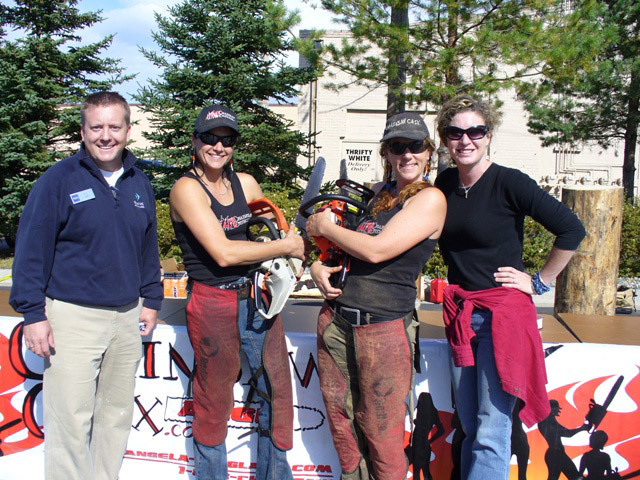 The Chainsaw Chix can be hired to draw unlimited media attention and offer your event something new and fresh. We have hand selected top female artists from Australia, Germany, and the USA. The Chainsaw Chix will be seen carving around the world and if you are lucky enough -you can catch them battling the talented men in this art form for prizes and money, not to mention bragging rights! Contact Jen Ruth at 1-888-Chainsaw for more information on the hottest thing to hit the entertainment industry in years!